I wanted to take a day off after doing Vegan MoFo for the entire month (didn’t miss a day) but my people are requesting my triumphant early return. I’m going to be making a similar recipe to share soon with a pumpkin filling that is soy free, too. I’m not sure if I will just update this post and alert people to the fact that it’s been updated, or make a separate post. But keep an eye out for it! I posted this picture on What FAT vegans eat Facebook group and many people requested the recipe, so, here it is. It’s easier the bigger you make them. 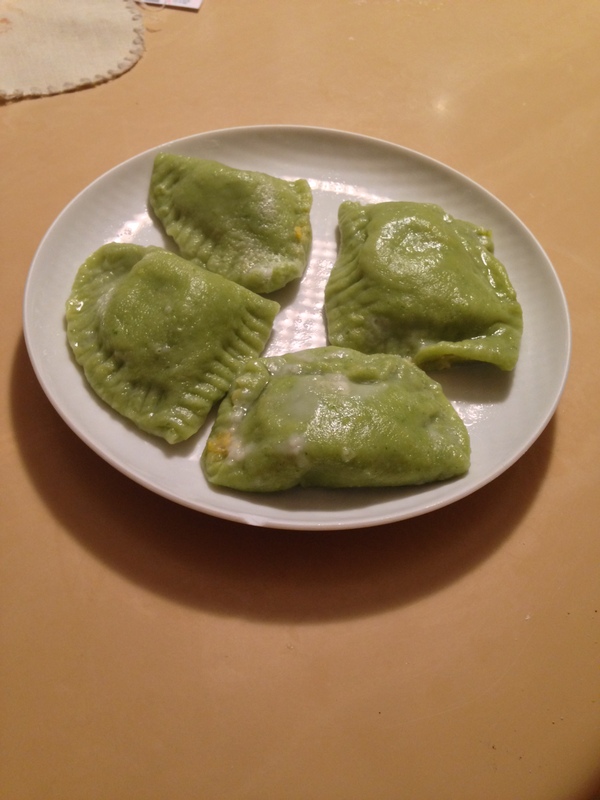 I haven’t quite perfected the technique of forming the ravioli. I don’t actually care if they look slightly misshapen, as long as they’re delicious. That they definitely are. 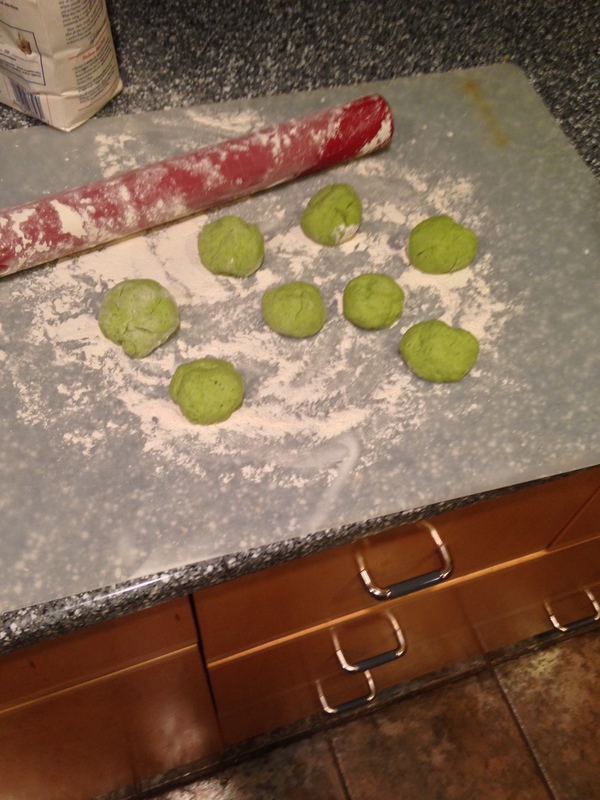 1/8 of the dough rolled out to form the ravioli. This gets cut in half to make two ravioli. 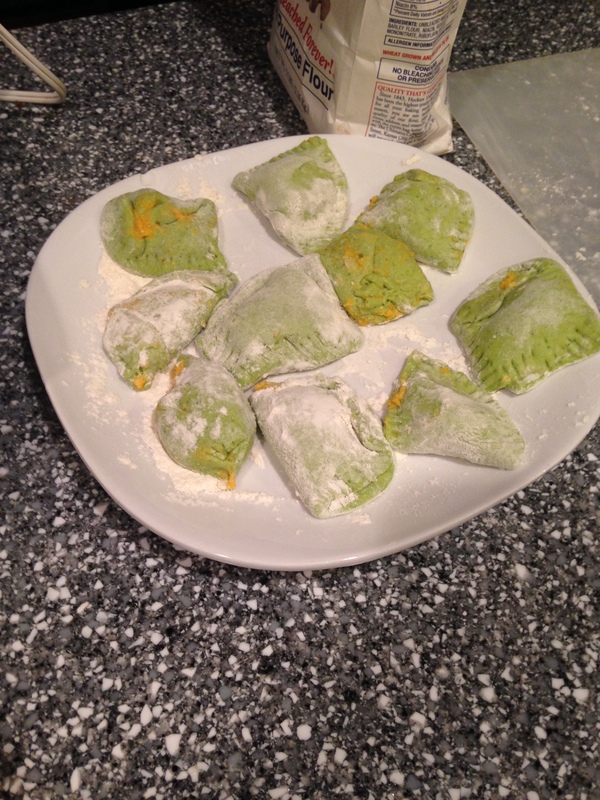 On the left is a ravioli in progress. The filling is on the other one, waiting to be formed. Roast the butternut squash in a dish with the olive oil and pepper in a 400 degree (F) oven for 30 minutes to an hour until slightly browned and caramelized. Take out a large bowl and place the flour and salt and stir. In a food processor or blender, blend together the spinach, water, and sage until liquified. 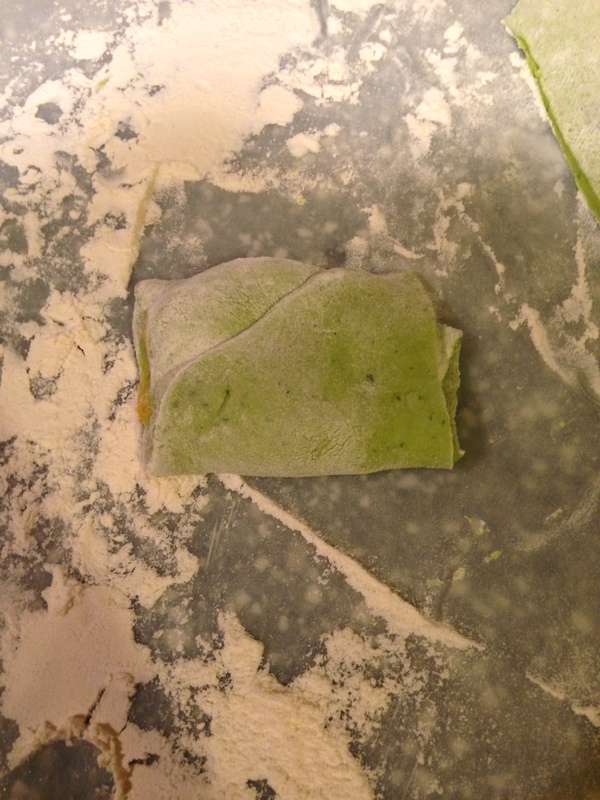 Drizzle the olive oil on top of the flour mix, and then add the spinach, water, and sage liquid. Stir with a wooden spoon until all the flour is incorporated and is not stringy or powdery. You may need to add 1-2 tbsp water to achieve this. 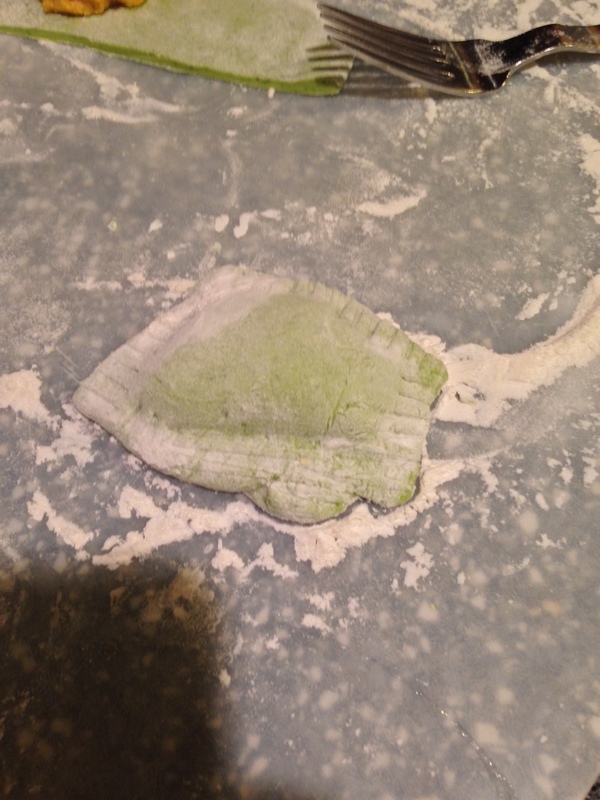 Knead the dough on a clean, floured surface for about 10 minutes straight. Do this with a combination of techniques. 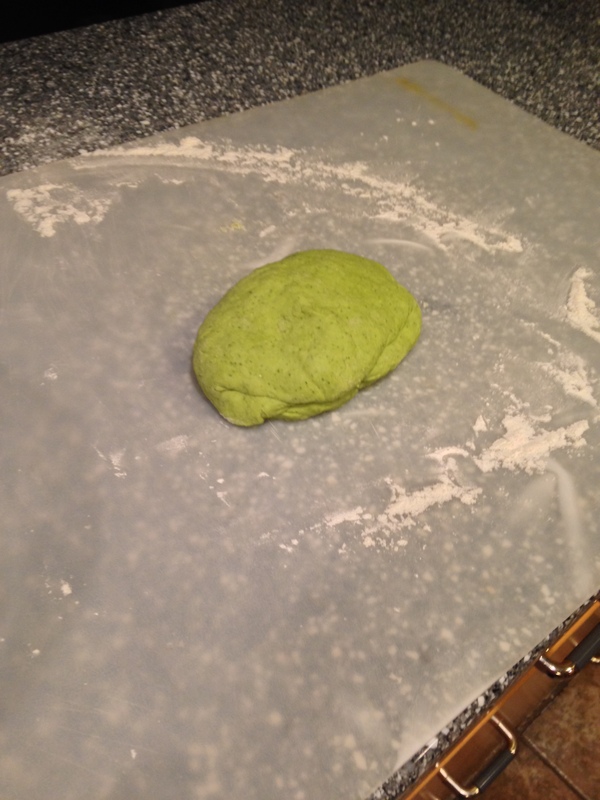 I like to squish my hands around in the dough, then roll it into a ball, and fold and roll it. Continue until smooth and a little shiny. Let sit to rest in the bowl covered in plastic wrap for 10 minutes. Make the filling by blending or processing the squash, sage, and tofu until smooth and fully combined, scraping the sides with the spatula to get everything incorporated. Now begin to work on the pasta. Separate the dough into 8 even sized balls. Flour a dinner plate, set aside a cup with water inside, take out a rolling-pin and dust it with flour, and set aside a knife and a dinner fork. Also flour your working surface again. 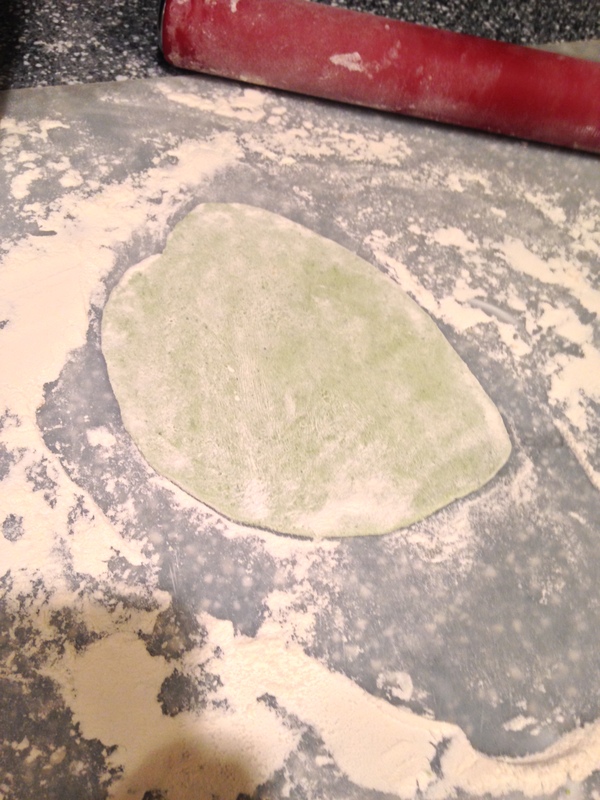 Roll the 1/8 dough ball as thin as possible. Try to make it in a rectangular shape. 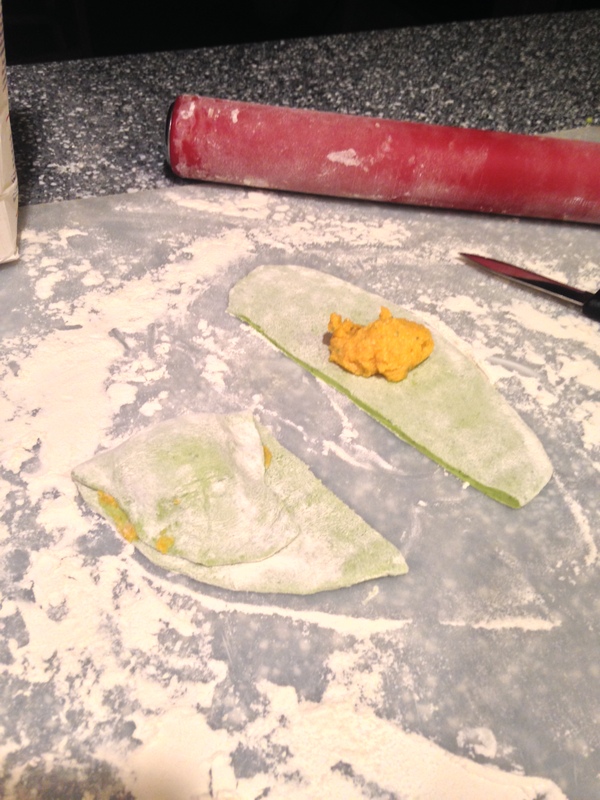 Cut the rectangular shape in half, and place 1 tbsp of the filling on the inside of each piece. Before folding the dough over the filling, wet water with your finger around the edges of the dough and fold around the filling so that the edges meet. Smooth them down. Take a fork and pinch around the edges to seal them and add a nice finished look to it. Dust with a bit more flour, and place on the floured plate. Continue steps 11-15 until you are done with the dough. If you don’t intend on cooking them all right away (which would require a pretty large pot, by the way if you do want to cook them all…I cooked mine in batches of 4-8 at a time) you can flour a tupperware container and place them inside and keep them in the fridge until you want them, for no more than a week. You could also place them in the freezer for even longer. To cook, boil a pot of water. Place in the water when boiling, let them sit in there, adjusting the heat on the stove as necessary, until they float to the top. This will take about 7-10 minutes. Eat once slightly cooled. They’re so good they don’t need much else, but maybe a creamy sauce would be good. 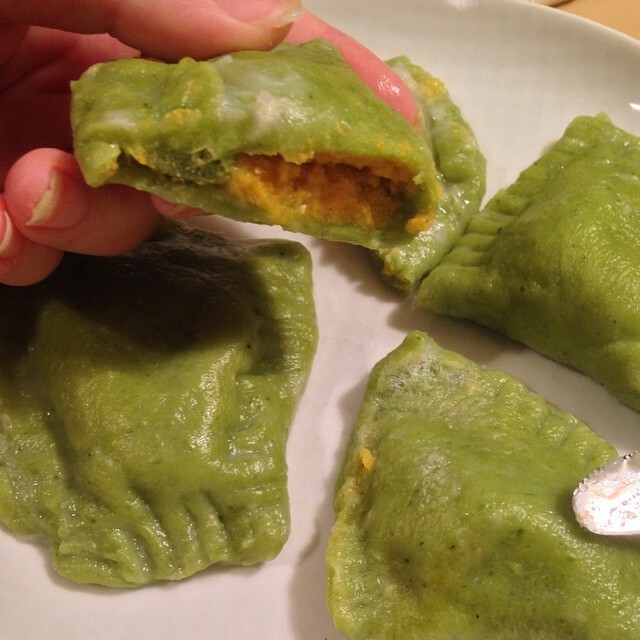 This looks so great, I love ravioli! I just finished them off, they were so good. Gotta try the other soy free pumpkin idea this week I think!